The item John Brown, (electronic resource) represents a specific, individual, material embodiment of a distinct intellectual or artistic creation found in Richland Library. Few figures are more seminal in the abolitionist movement in America than John Brown. His firebrand approach to the movement arose out of his religiously inspired and deep-seated belief that slavery was not only morally unjust but that its removal from American society could only be achieved through armed insurrection. Following his capture in 1859 during an unsuccessful raid on the federal armory at Harpers Ferry and his subsequent hanging he became an electrifying and symbolical figure for the abolitionist movement. Many historians argue that the incident at Harpers Ferry was the breaking point between pro and anti-slavery forces that led to the secession of the southern states and the subsequent Civil War. Prominent African American W.E.B. 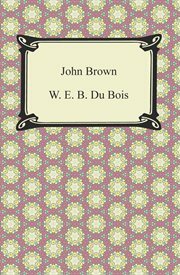 Du Bois chronicles the life of John Brown in this 1909 biography. In the words of Du Bois, John Brown was "a man whose leadership lay not in his office, wealth or influence, but in the white flame of his utter devotion to an ideal."